This page contains a repository of sorts of the artwork we have created at the Grantham Church. We started creating sanctuary-specific artwork at the inauguration of our annual Worship Arts Weekend in April 2004. We held these weekends in March/April each year until 2011. Some of the artworks were commissioned by individual artists for this weekend celebration of the arts, and some were created by groups of artists for a specific sermon series. 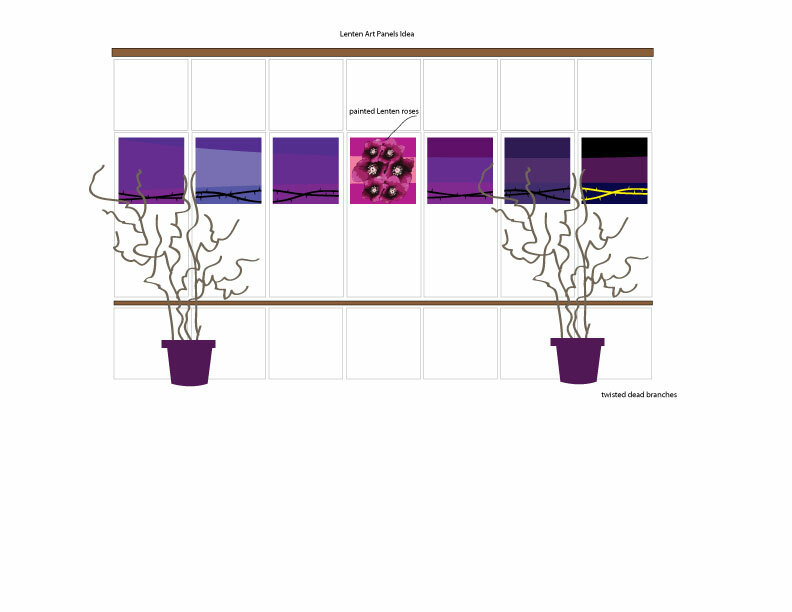 Check the table below for various groupings of artwork, with diagrams, photos, descriptions, and artist's statement where applicable. During this Lenten Season we hosted a curated gallery exhibition with contemporary artists presenting their unique expression of the theme Stations of the Cross. 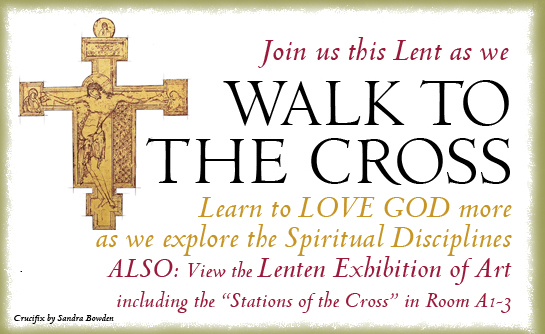 We created a prayer walk which guided people through the stations and gave them something to study in the artwork, reflections, and poems to help them engage with the artwork, and move more deeply into the quiet of Lent. We hosted an art gallery exhibition of the collections of John Alan Kohan. 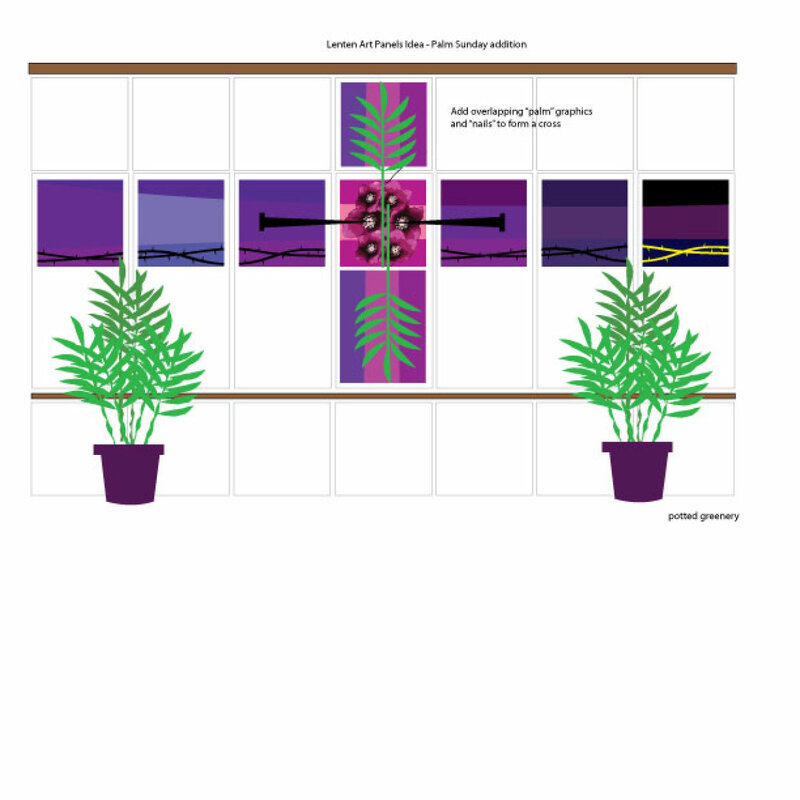 We provided a written gallery guide that helped people understand the various crosses, and the artists who created them. 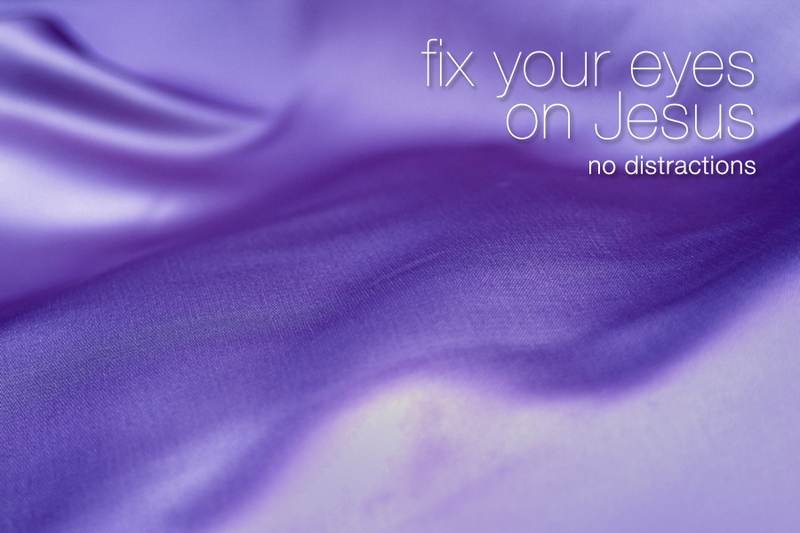 This season we created seven 3x3' foam panels with the liturgical colors of purple. 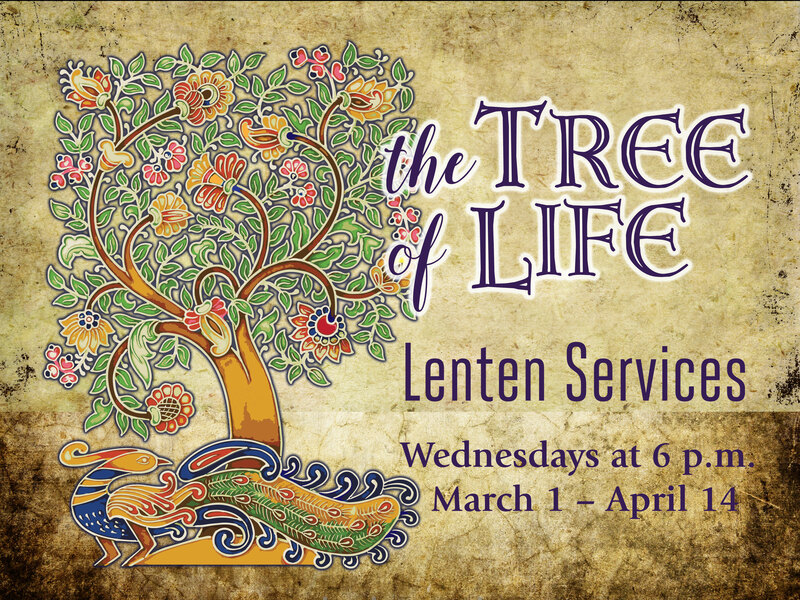 The central panel features the Lenten Rose, and marks the center point of the season. Traditionally this Sunday would be a joyful worship to contrast with the others which would be more subdued. On Palm Sunday we changed it up a little to include green "palms" and then Easter Sunday the squares rearranged to form a golden cross which remained on the wall for the entire season of Easter. The other element was the pots of "dead" branches which were switched out for bright green potted trees and palms at the end. taunted the Israelites for 40 days and nights. 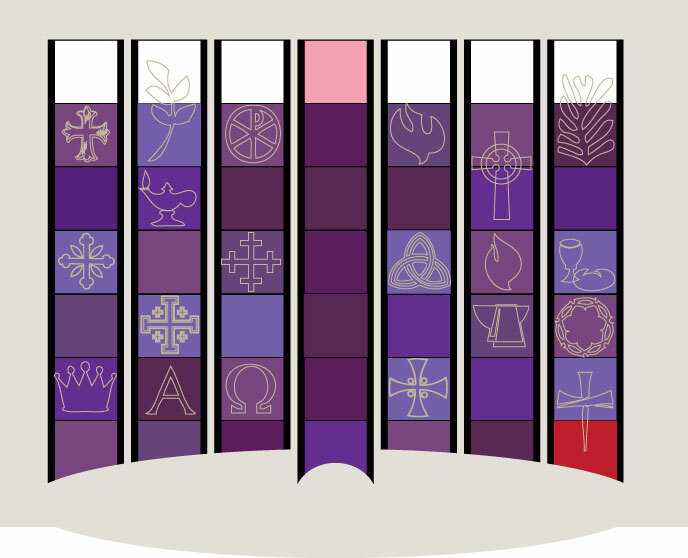 Symbols of Christ and his life, passion, death and resurrection fill the purple strips which are designed to represent our shared “calendar” of fasting. The white boxes are the Sun-days when we do not fast. The central Sunday is traditionally called Rose Sunday, and worship was meant to be a more joyful break from our fasting. These banners were created in 2011 by Geoffrey Isley. In 2016, Geoff collaborated with Bonnie Prior to modify the banners and to incorporate some new elements. This year, the visual art includes dead “branches" with note cards containing the prayers of the congregation for their personal spiritual discipline and renewal in this holy season. This is the reverse side of the same purple Lenten panels, with gold paint and gold foil that are re-positioned to form a cross, keeping the Lenten Rose square in the center. The dead branches in the pots have been replaced with green, growing plants and fresh cut forsythia branches. I wanted this image to look dry, empty, and desert-like, and the figure to show Christ walking away from us. He is intentionally headed into the wilderness for a time of temptation, testing, and fasting. The number 40 represents the concept of a long time of hardship or trial. There were 40 days and nights of rain in the Ark, 40 years of wandering in the desert, and Christ’s own 40 days of temptation. The number 40 informs our Lenten practice. Unlike the random times of wilderness that invade all our lives eventually, this is intentional. We are invited — with Jesus — into this season to find some quiet, deny ourselves something that usually brings pleasure, or identify more closely with Jesus’ sacrifice by giving generously to kingdom work. Our experiences in these “dry times” prepare us for walking compassionately with others who are experiencing their own wilderness. This image was created as a deliberate contrast to the desert scene we saw for the past 40 days. Full of joyful, hope-filled color, the landscape now is in full bloom. The figures walking toward the viewer could be the disciples on the road to Emmaus, just after Christ’s resurrection. I was hoping to remind us that we are not alone. Jesus is on the road with us too, and our job is to be alert to his presence and stay on mission with him as we walk bravely each new day. The artwork is a digital print on foam core. 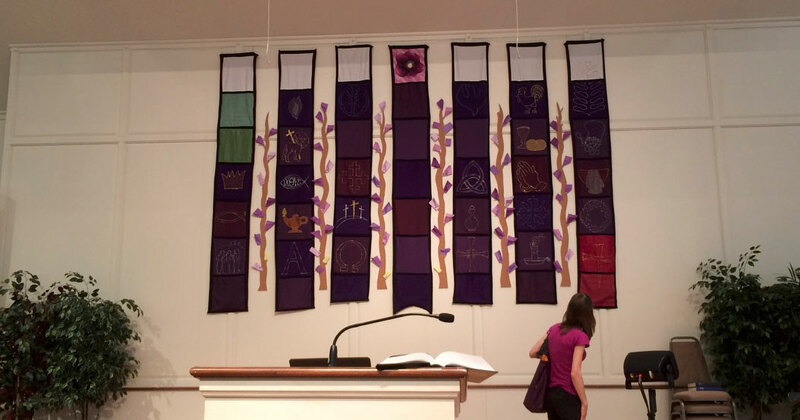 These “Candle” advent panels hanging at the front of the sanctuary were created in 2005 as a collaborative art project by Polly McCann, Susan Getty, Bonnie Prior, and Geoff Isley. Each candle is made up of many symbols and images which help us think about the themes of Advent as we wait for the birth of Christ. The 2005 Advent sermon series gave the theme of "the Light of Christ", so the imagery is about what His light reveals to our eyes. These “candles” hang before a lustrous field of heavenly gold which dominates over the comparative dark of the earth. Gold, of course, is a precious metal, but its beauty also consists of its reflective quality. Light is reflected from various sources, but it always reveals something to our eyes that we could not otherwise see. This mixing of heaven and earth is what Christmas is all about! This series of banners was conceived as a graphic homage to classic nativity artwork and stained glass, with a collage texture to hold it all together. I found many wonderful compositions and poses among classic paintings from the many centuries of art history. Virtually every great artist was commissioned to do a nativity during their lifetime. In fact it is so popular a theme that it's difficult to create anything new with any sense of freshness about it. So, I drew visual "quotations" from these great painters and created a completely new composition with all of the figures in the "Portraits of Christmas" sermon series. As I worked on this for several weeks, I was struck by the presence of angels in every part of this story, so I worked figures of angels into each banner. I love how God's great plan of incarnation was a surprise to the heavenly creatures as much as the earthly. I also chose to incorporate as backgrounds, a series of collages I had been working on this year. I love how this great story was recorded for us by an ancient people, and was continuously retold in many languages -- in stone, on papyrus, parchment and then paper. I layered these torn fragments with very irregular edges and beautifully- hand-penned script, in Hebrew, Greek and other ancient languages to create these collages. You’ll see a huge scroll — a section of the Great Isaiah Scroll from the Dead Sea Scrolls. During the Advent season the congregation would see many words from the prophets, some complete, some were just partial words, but they would be revealed in time. And some of the words have special meaning in the Christmas story, but we are asked to reexamine how we internalize these words in light of the reality of Christ’s coming. Each week in Advent, another portion of the word cloud was painted in. Only on Christmas Sunday was the entire picture complete. As a way to emphasize the community aspect of our worship, various members helped with this painting, painting together for an hour or two each Wednesday during Advent. This advent an idea to create stained glass was floated, and at first we said, "No way, we don't have the time!" But maybe mosaic stained glass... So we put out announcements to ask for donations of windows and glass, and we started to gather each Wednesday in October and November to glue shards of glass own on the windows. This year we installed the stained glass windows again, but we had the time during the summer months to finish the grouting on them, so they appeared more brilliant and intense in their colors. This year it was much less time-consuming, and the congregation really enjoyed seeing the windows again. We hung them from the start of Advent until the end of January. A number of volunteer artists joined to put the grout on, and the volunteer who created the hanging system agreed to reinstall the windows. In 2006-2007 the church created a series of 10 robes for a series our senior pastor Dr. Terry L. Brensinger preached called "New Clothes: exploring the BIC Core Values." I am working to create a page on this series soon. stay tuned! The image here depicts the second core value: We Believe in the Bible. This artwork was created for a sermon Series on Healing. It constitutes 3 4x8' foam core panels, digitally printed in Harrisburg. To accompany the current sermon series on healing, I discovered this painting by J. Kirk Richards (born in 1976). Titled “Healing” but merely 4 inches tall, I knew enlarging it to this size (12 feet wide) would require some touch-up. So, I digitally enlarged it, adjusted the colors, and created the textures that would be better seen from across our large worship space. understanding and receiving the healing we need. WHAT I’M DESIGNING HERE is the idea of heaven and earth coming together in Christ. He is the center, the bridge between these realms. The shadows of various steeples remind us that we, as people, have tended toward grand and glorious buildings we have named “church.” The steeple directs our eyes to heaven, a symbol of the truth that Christ has come, and the Church on earth is a reflection of this “here, but not yet” Kingdom. These churches are visible, tangible, and these structures speak to us from the past that faithful Kingdom people were here, and worshiped Jesus Christ in this place. The visual elements I have pulled from are the actual things we have built — bricks and stone. I see them as icons that direct our interest and attention to the mystery of building a church with people—“living stones.” I am intentionally playing with both the humble stone and brick, against the precious gold. That is a metaphor church architects and artists have used for ages. temple in which God is quite at home. This is 4 panels of 4x8' foam core digitally printed from an Adobe Illustrator vector file, so it is scalable (larger or smaller) without losing clarity. The 6-week sermon series dealt with the four major streams of theology that historically influenced the Brethren in Christ: Anabaptism, Wesleyanism, Pietism and Evangelicalism. For the inaugural Worship Arts Weekend we created this series of banners, digitally printed collages containing images from scripture on the four outer panels, and a center image -- pillar of cloud-like -- depicting the fact that all our zeal for the arts comes from God Himself. The concept for this piece was that after the season it hung in front, the side panels were cut into separate collage images and sold to community members to help fun the new gallery program. 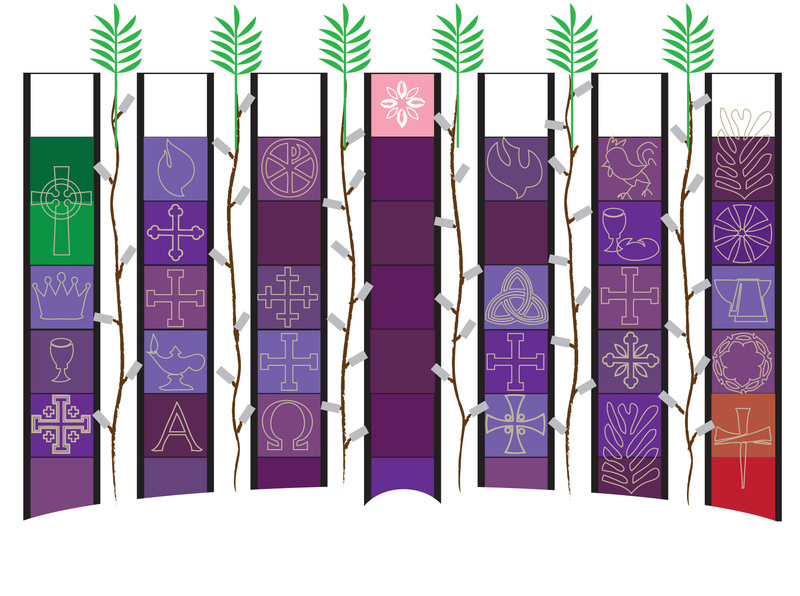 This "Burning Bush" banner was commissioned by the church for Worship Arts Weekend in 2008 to celebrate the burning inspiration of the Spirit of God in the creative process. It was intended from the start to also be hung to celebrate Pentecost. It measures 8x8' and is printed digitally on a polyester mesh material. This triptych banner was commissioned for Worship Arts Weekend in 2007 as a celebration of the arts and a theme of Communion. The intention was to hang it during the spring during and after that Worship Arts Weekend, and then on special communion Sundays. The banner incorporates imagery of worship arts: drama, music, and visual arts, overlapping with the new handmade ceramic communion plate and chalice also commissioned by the church. This measures 5x8' and is digitally printed on a polyester fabric.